The Foxtail Lodge – exclusively for FaMESHed January 2013! 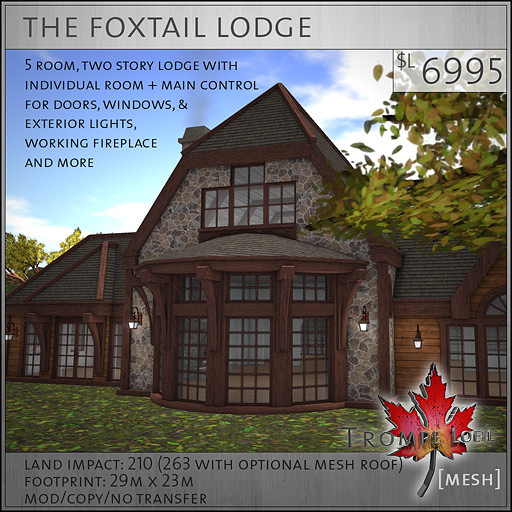 Trompe Loeil is proud to announce our biggest and best mesh prefab yet – The Foxtail Lodge! Two stories and five rooms with individualized scripted controls for windows, doors and exterior lights, all at an incredibly low prim count – exclusive for FaMESHed January 2013! Welcome home to your mountain or forest retreat – the beautiful Foxtail Lodge in handcrafted slate flagstone and rustic woods. Enjoy tons of natural light through the full sized French doors that lead into the kitchen, living room and both bedrooms. The oversized fireplace in the living room invites you to curl up in your favorite chair and watch the world go by through the floor-to-ceiling windows. Ready for some privacy? Click the fireplace to put out the flames and light, and use the Home Control Tablet to set the windows to dim or closed. Easily add group or manager access for the whole family. The unfinished attic is right at the top of the stairs – a full-length area perfect for an extra bedroom, play room, or work space. The peaked ceilings in both bedrooms and the kitchen give an airy sense of space while still keeping things cozy. Lock the doors, dim the windows and turn on the lights for a little privacy using the Wall Control Panel conveniently located right inside each room. The off-white textured walls tint beautifully, and are carefully crafted to allow owner tinting per room. Match your existing decor in a snap! Featuring a spacious 29 meter by 23 meter footprint and an incredibly low impact of only 210 prims, The Foxtail Lodge is perfect for the entertaining single or couple, or the family just starting to grow. Check out the inworld display at FaMESHed – exclusive to the January 2013 cycle!